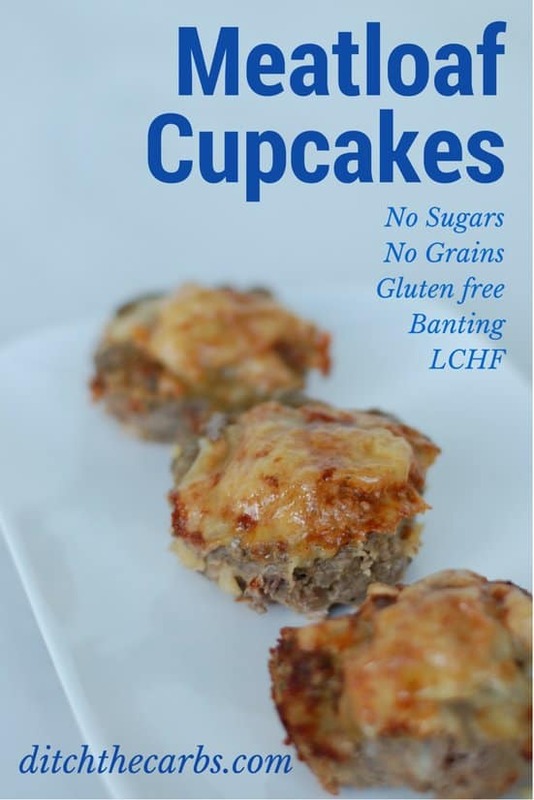 Ok so technically, meatloaf cupcakes probably aren’t real cupcakes, but the idea is a cute one and it’s such a quick and adaptable base recipe. 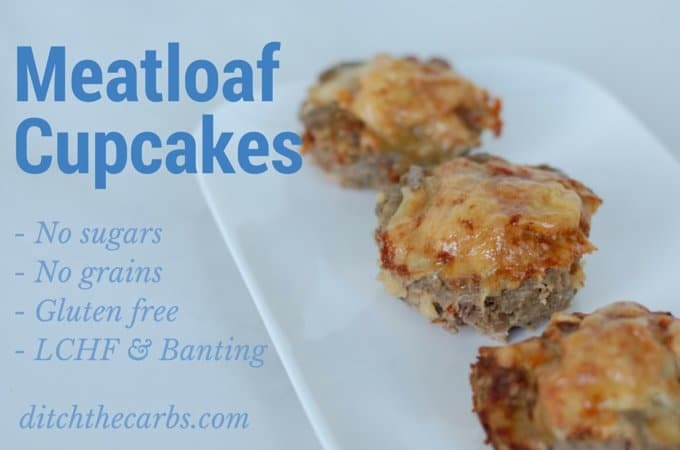 Just mix up mince/ground beef with whatever you have at hand, add your favourite flavours to make these easy meatloaf cupcakes. Anything smothered with cheese, is always an instant hit with my children. And if you have been following my recipes for a while, you know I love adding hidden veggies wherever I can, and these are no exception. You can even hide organ meat in here (just don’t tell my kids). How about topping with mashed cauliflower to ‘ice’ the meatloaf cupcakes? Everything really does taste better in miniature. Have 2 or 3 for dinner, or they are a brilliant idea for breakfast or lunch the next day. They are sturdy and portable, high in protein and extremely low in carbs. The best thing is, unlike a regular full sized meatloaf, the meatloaf cupcakes are so quick to cook. I’m always going on about “leftovers are king” but these really are. Make a huge batch, vary the flavours and freeze them. You will always have a snack, lunch or breakfast ready. Serve with homemade ketchup, mashed cauliflower and plenty of leafy greens. 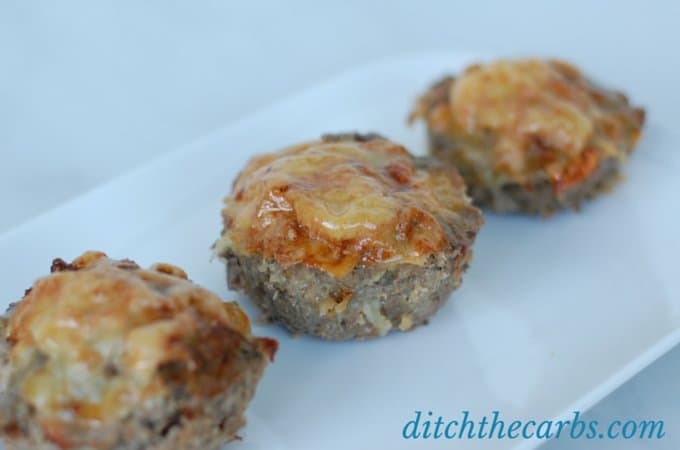 Versatile and easy meatloaf cupcakes are great for dinner, lunch or the school lunch box. Make extra as they freeze really well in an airtight container. They can even be used when you need a protein hit. Mix the diced onion, meat, eggs and salt and pepper together. Add your choice of seasonings and flavourings. I have given one example, but take a look below for a huge range of ideas. Mix all the ingredients together with your hands and place a small handful of the meatloaf mixture into muffin trays. Press gently, not too hard, otherwise they will turn into meatballs. Cover with the grated cheese, and sprinkle with grated parmesan if desired. Mince/ground meat can be beef, pork, turkey or meat of your choice. Nutrition values will vary according to which meat you choose and how lean it is. Try to choose the medium-fat meat. Otherwise too much fat will render out. meatloaf without breadcrumbs/crackers is just a hamburger tbf. Maybe call them Baby Hamburger steaks or something like that would be more appropriate. Either way, the reason people are getting all the grease overflowing into their oven is because you are literally cooking hamburger meat (likely standard 80%/20% fat kind), bacon, and cheese, which all have big pools of grease or oil when heated. I have no problem with fat, but this recipe probably wasn’t really thought out properly. If there is too much fat rendering out, try to buy lower fat meat. I tend to choose the medium fat (not lean and not full-fat). Otherwise yes, it’s pretty logical that the fat will render out into a pool at the bottom of the muffin tray. OK, now some meatloaf history. “Meatloaf is a dish of ground meat mixed with other ingredients and formed into a loaf shape, then baked or smoked”. Only the American “version” of a meatloaf contains such hideous ingredients such as crackers. “During the Great Depression, cooking meatloaf was a way to stretch the food budget for families in the US by using an inexpensive type of meat and other ingredients as leftovers. It was popular to add cereal grains, bread or saltines to the meatloaf to stretch the meat. This tradition of additions lives on with the goal of producing a lower-fat dish. Thanks for the history. Meatloaf is my hands down favorite meal served w scalloped potatoes and creamed corn. And yes, I’m in the US. So now I will be skipping the potatoes and corn (oh my) and experimenting w my add ins to my meatloaf. My family uses a mix of beef, pork and veal and the market even calls it meatloaf mix. So not too much grease so I think I won’t have the overflow. Love the idea of making it in muffin tins. I have mini loaf pans that are 1-2 servings so I might use them too. Went looking for meatloaf recipes today after you posted the pizza video on Facebook. Thank you!!! Is the nutrition information for 1 mini meatloaf or the full recipe? Nutrition is always per serving, so in this case, per cupcake. Hello i just made these and there was alot of liquid in each tin! Is it supposed to be this way? Me too! In fact, the tins were dripping onto the bottom of my oven! Just took them out of the oven and can’t wait to try them but messy YES! What a fun idea, love it! Do you cook the bacon first or put the bacon in the recipe uncooked? Also, what type of cheese do you recommend? I add the bacon raw and it cooks inside with the mince/ground beef. Any cheese will work, I personally use Edam, Colby or Mild. Everyone will have their favourite. Even parmesan sprinkled on the top would be lovely. Thanks! Also, is this recipe for 12 cupcakes? So good I had to stop myself from eating a bunch right then and there, since I’m planning to freeze them for easy snacks with my son. Definitely a winner! They should cook all the way through. I would look at your bacon in case there is colouring in it. Some manufacturers add a special salt to stop the meat from browning as it is stored so maybe that’s it? If the meatloaf was firm and piping hot throughout, it should be cooked. Do you have a meat thermometer, just to be sure? Yay, a metric supporter!!! I am a kiwi so work in grams and weights. I am on a mission to show everyone how easy and accurate cooking by weight is. Place your mixing bowl on the scale add and ingredient, zero, then add the next, zero…… Sooooo so easy 🙂 I add lb and oz for my American followers, and are now converting many to cups also so eventually I will show all 3. Thank you for adding oz & lb for us Americans! I so enjoy your website and make a lot of your recipes. I also appreciate the education you have provided on LCHF. It’s very helpful. I’m in the USA and I so appreciate the button to press for US measurements at the bottom of your ingredients lists, as most all my recipes are from your site and it saves me from repeatedly figuring. YAY – I am so glad you are finding that tool helpful. You don’t want to know how many hours it took me to manually update all the old recipes – yikes!!! So yummy and a perfect little lunch. Loving your recipes. They have been a lifesaver! These look yummy, I’m sure my 3-year old will approve too! One question though, don’t they turn out a bit dense without a substitute for the breadcrumbs or oats that usually go in meatloaf? I made meatballs with no … filler? … a few days ago and was disappointed with the dense texture. Any recommendations on that front? Yes they are a bit heavy compared to a regular meatloaf, but bump them up with more veggies, grated carrots, spring onions, bacon pieces, cheese etc and it make them a bit lighter and even more packed with nutrition. I love your recipes. I just started on Keto about 12 weeks ago, and I’m excited and disappointed at the same time. 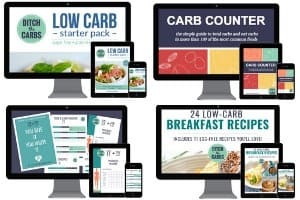 I followed the low carb eating exactly, and some weeks I lose weight and some I don’t. Sadly, I gained… I believe this is a great way to eat to prevent diabetes or to better manage it, so I want to stay the course. But, it’s so disheartening to gain 4.8 lbs in one week. I just added blended tea with butter (2 tbsp), heavy whipping cream (2 tbsp), liquid stevia (3 drops) & cinnamon. It was delicious and filling. I didn’t eat until that evening. Oh, I went to the farmer’s market after your suggestion about cracklings, which I love. They not only had the pork skins; they also had the meat attached to the rind. It was so delicious, and eating it cut my appetite completely. But, when I weighed on Sunday, instead of losing, I had gained. OMG!!! So I wonder, “Can you have too much fat on Keto?” Or, I may be sensitive to dairy. I have been eating more cheese, whipping cream, cream cheese, and butter (within the recommended amounts). I never ate them until now. Now, I’m not so sure of what to do. Any suggestions??? I really want to stay Keto, but I also want to lose over 150 lbs and prevent diabetes (which runs in my family).I usually eat less than 20 grams of carbs. I record my food daily, but I don’t calculate the macronutrients. I focus on the carb count. I try to get most of my carbs from the vegetables. I eat a lot of broccoli. Just started kettlebell lifting. Love it! You are the best! Thanks for the encouragement! I love what you suggest about changing one thing at a time. I will and persevere…and not give up. What a great idea! One spot of proofreading…”They are study and portable, ” I think you meant “sturdy”?